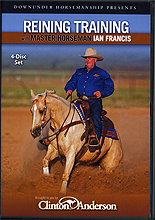 Legendary horseman Ian Francis brings his knowledge and skills to you. Ian and Clinton use several horses at different levels of training to walk you through roll backs, circles, spins, speed control, lead changes, sliding stops and unbelievable collection! One of the most comprehensive and detailed DVD series on reining ever produced, youâ€™ll be amazed at the new level that you and your horse can compete at once youâ€™ve applied these methods! An outstanding trainer with an incredible resume, Ian is an AQHA Hall of Fame inductee, Australian NRHA Hall of Fame inductee, Australian NCHA Hall of Fame inductee, 5-time Australian NRHA Open Futurity champion, 3-time Australian NCHA Open Futurity champion, and 2-time Conclurry Stockmanâ€™s Challenge champion, the ultimate performance cowhorse event in Australia. In each series of this DVD collection, Clinton speaks candidly about his memories of Ian, his longtime mentor. If you want to learn the training secrets of a champion, this is your one chance to see and learn from a living legend!